Big things are coming for Whyalla and the Eyre Peninsula! Late last year several noteworthy investments were announced that will have a significant benefit to our region. On Monday 10 December, Liberty Primary Steel announced the signing of contracts worth more than $600 million, which is a significant step towards the transformation of Whyalla’s iconic steel operations. Part of Sanjeev Gupta’s GFG Alliance, Liberty Primary Steel has signed two contracts for the design of equipment and construction with partners Danieli and CISDI Engineering Co. 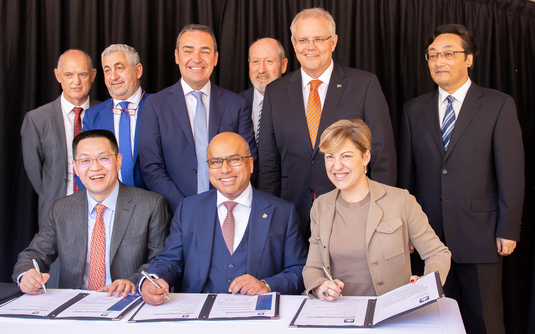 The contracts for a new state-of-the-art rail and structural heavy section mill and for a Pulverised Coal Injection (PCI) Plant will play a key role in securing Whyalla’s future. Mr Gupta said the transformation will improve the operational, financial and environmental performance of the operations and pave the way for Whyalla to become a global hub for innovative industry. “Today’s announcement signifies a major milestone in the Whyalla Transformation Program that will establish our operations as a viable and sustainable facility, producing 1.8 million tonnes of high‐ quality, high‐end steel per year. Whyalla City Council also announced a $45 million investment into a new hotel on the Whyalla foreshore (Pelligra Constructions), as well as a $145 million horticulture development (Beijing Enterprises Clean Energy) and a $6 million recycling business (Peats Soil & Garden Supplies). Mayor Clare McLaughlin said this was the most exciting time in Whyalla’s history. The Whyalla investments come on the back of the recent announcement of an orbital launch complex at Whalers Way near Port Lincoln, which will be bolstered by the selection of Adelaide as the home of Australia’s new space agency. Construction at the site is expected to begin in 2019, and will allow satellites to be launched into space by both local and international companies. Adelaide was announced as the home of the national space agency today. Regional Development Australia Whyalla and Eyre Peninsula CEO Dion Dorward said the Eyre Peninsula has had a productive year for new investments to diversify the economy. “The South Australian government announced funding earlier this year for Australia’s first renewable-hydrogen electrolyser plant near Port Lincoln. The ‘green hydrogen’ plant will include a 10MW hydrogen-fired gas turbine, fuelled by local wind and solar power, and a 5MW hydrogen fuel cell. Both will supply power to the grid, support two new solar farms and a local micro-grid, and include ‘distributed ammonia’ that can be used in industrial fertiliser for farmers and aquaculture operators. Also announced was the purchase of land at Sleaford Bay for the construction of an $80 million desalination plant, with construction likely to begin in the next 18-24 months. “We have worked very hard, collaboratively, to ensure many new opportunities to diversify our regional economy transpire,” Mr Dorward said. This significant level of investment in the Eyre Peninsula throughout 2018 demonstrates industry and Government are recognising the region’s potential. These investments are expected to provide a substantial boost to the local economy and to provide new jobs across different industries.